Vox Continental Type 1 Harmonica – Introducing VOX’s first-ever harmonica series – a new collection of harps with an authentic rock vibe! VOX is proud to introduce its first ever harmonic series. A collaboration with the SUZUKI Musical INTS. MFG. 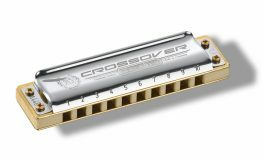 CO., LTD., this series fuses the exciting rock spirit of VOX with the proven and timeless design of a SUZUKI. This series inherits the Continental moniker, a reference to VOX’s iconic organ, and features two models: The Continental Type-1 and the Continental Type-2. 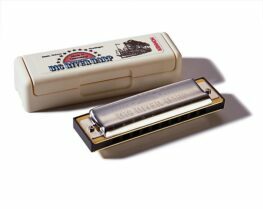 From aggressive garage rock to melodious ballads, these professional harmonicas are perfect for nearly any genre. 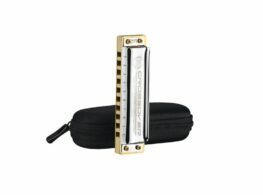 The VOX Continental Type 1 is a ten-hole harmonica with an aggressive, resonant sound that is perfectly suited for the classic genres of blues, rock, folk and more. Made in Japan, by Suzuki, it features the unique wood-resin hybrid comb that’s normally only found on Suzuki’s Manji and Olive models.